Dosage & Administration: Apply a thin film over the cornea three or four times daily in dogs and cats. The area should be properly cleansed prior to the use of Vetropolycin® (bacitracin-neomycin-polymyxin) veterinary ophthalmic ointment. Foreign bodies, crusted exudates, and debris should be carefully removed. INDICATIONS: In the treatment of superficial bacterial infection of the eyelid and conjunctiva in dogs and cats when due to organisms susceptible to the antibiotics contained in the ointment. Laboratory tests should be conducted including in vitro culturing and susceptibility tests on samples collected prior to treatment. 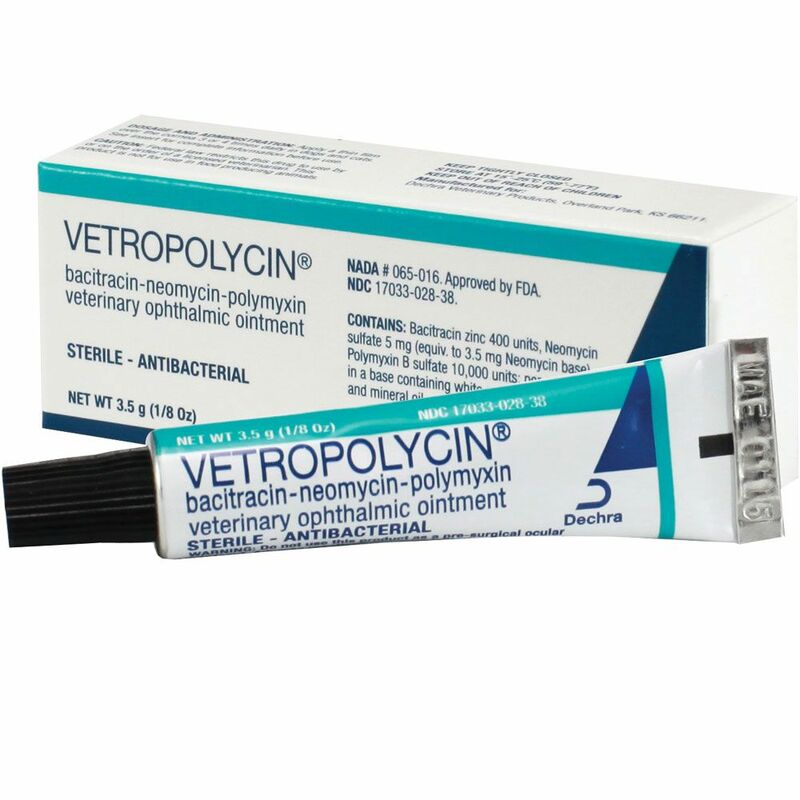 PRECAUTIONS: Sensitivity to Vetropolycin® (bacitracin-neomycin-polymyxin) veterinary opthalmic ointment is rare; however, if a reaction occurs, discontinue use of the preparation. As with any antibiotic preparation, prolonged use may result in the overgrowth of non-susceptible organisms including fungi. Appropriate measures should be taken if this occurs. If infection does not respond to treatment in two or three days. the diagnosis and therapy should be re-evaluated. ADVERSE REACTIONS: Itching, burning or inflammation may occur in animals sensitive to the product. Discontinue use in such cases. CAUTION: Federal law restrict this drug to use by or on the order of a licensed veterinarian. WARNING: Do not use this product as a pre-surgical ocular lubricant. Adverse reactions of ocular irritation and corneal ulceration have been reported in association with such use.